Introducing a quality kit, the Thunder Tiger eHawk 1500 Balsa Kit . 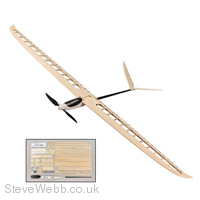 Laser cut balsa with the ABS blow mould fuselage and carbon look fibreglass tail boom make this glider kit outstanding. Includes a full scale drawing and step by step assembly manual. Great for those young kids as an educational kit or professional modellers as a reminder of how to build up balsa kits. The kits comes without electric device as well as the covering that user need to purchase in the hobby shop when buying this kit.